MELBOURNE, Australia — In the west of the sprawling metropolis that is Tokyo lies Yokota Air Base, a major air transportation hub in the U.S. military’s Indo-Pacific Command’s area of responsibility and a critical waypoint for cargo, passengers and VIPs. Occupying an area of approximately 2.75 square miles that includes a single 11,000-foot runway that runs roughly north to south, the base is also home to U.S. Forces Japan, a joint service headquarters coordinating matters affecting U.S. and Japanese defense relations, and Fifth Air Force, whose mission is to enhance the U.S. deterrent posture and, if necessary, provide fighter and military airlift support for offensive air operations. Defense News traveled to Japan to see what an international aerospace exhibition and local air show had to offer. Other tenant units on base include the 730th Air Mobility Squadron of the 515th Air Mobility Operation Group, which manages air mobility operations throughout the Western Pacific, and the Japanese Air Defense Command, which controls Japan's air defense mission. Air traffic control for the base is integrated with Tokyo’s air traffic system, a must given the busy nature of the skies above the Japanese capital with its two international airports and a number of Japanese Self-Defense Force bases in the vicinity. The visitors have included secretaries of state and defense Mike Pompeo and James Mattis during their visits to the region, as well as President Donald Trump who landed there during a visit to Japan in November 2017. The host unit at Yokota is the 374th Airlift Wing. The Wing includes four groups: operations, mission support, maintenance and medical. Each group manages several squadrons in order to carry out the wing's mission, which is to execute rapid global mobility through agile airlift operations across the Indo-Asia-Pacific region and as the primary Western Pacific airlift hub for peacetime and contingency operations, the wing provides airlift for the movement of passengers, cargo and mail to all Department of Defense agencies in the Pacific area of responsibility and provides transport for people and equipment throughout the Kanto Plain and the Tokyo metropolitan area. In addition to the Lockheed-Martin C-130J Super Hercules tactical airlifters of the 36th Airlift Squadron, the other flying squadron at Yokota is the 459th Airlift Squadron. The unit operates a mixed fleet of Bell UH-1N helicopters and Raytheon C-12J Hurons to fulfil its mission of providing airlift support for distinguished visitors as well as other priority passengers and cargo, along with conducting aeromedical evacuation, search and rescue and priority airlift missions throughout the Pacific. 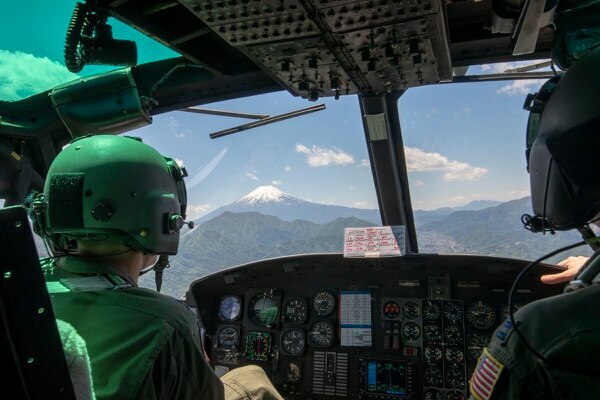 The UH-1N Huey, whose design dates back to the Vietnam War, is used by the 459th AS to provide distinguish visitor and cargo transport throughout the Kanto Plain which encompasses the Greater Tokyo area, according to Major Matthew Sims, assistant director of operations of the 459th AS. In addition, he told Defense News that the type is also used to provide medical transport and search and rescue assistance for the government of Japan, and can be configured with a rescue hoist and litters for medical cases as the mission requirements demand. The twin turboprop-engined C-12J Hurons serving alongside the UH-1Ns at the 459th AS are used primarily for VIP transport. However, they have also become the primary response aircraft for small-scale aeromedical evacuation. An aeromedical evacuation nursing team is now deployed to the base on a rotational basis, with each team there two- to three-week deployment to support the mission. The use of the C-12J, which is based on the Raytheon 1900C regional airliner, has significantly freed up the USAF’s primary aeromedical evacuation platform, the KC-135R tanker, to perform its primary role and Major Drew Skovran, 459th AS Assistant Operations Officer called the C-12J “the most cost-effective airlifter for small groups in the PACAF inventory carrying 10-18 passengers or up to 3000 lbs of cargo. With the addition of a converted hospital bed we are one of the premier platforms for aeromedical evacuation for all joint partners in the AOR”. Non-flying elements of the Wing includes the 374th Logistics Readiness Squadron, which directs logistics for Western Pacific airlift hub orchestrates mobilization of wing and tenant units supporting Pacific Command's operations plans, currently stores over 13 million and issues over 36 million gallons of fuel. The sole USAF flying element at Yokota that is not part of the 374th AW are the Bell-Boeing CV-22 Osprey tiltrotor aircraft assigned to the 353rd Special Operations Group. 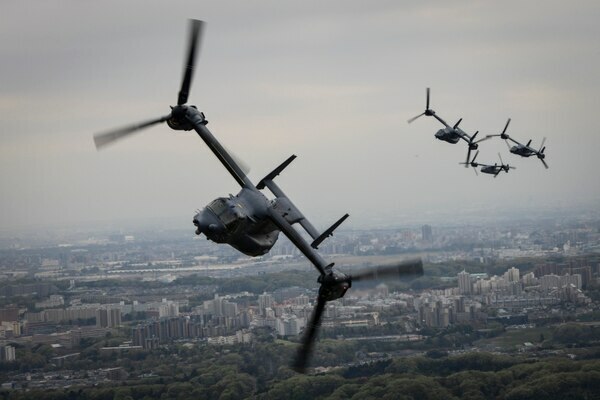 The first five Ospreys arrived at Yokota in April this year, and that number will eventually rise to ten. Four of the unit’s Ospreys were subsequently deployed to Iwakuni to take part in search and rescue operations following the collision of a U.S. Marine Corps KC-130J tanker and F/A-18D Hornet fighter jet off Japan in early December, joining the C-130Js of 36th AS along with other U.S. military and Japanese Self-Defense Force aircraft. 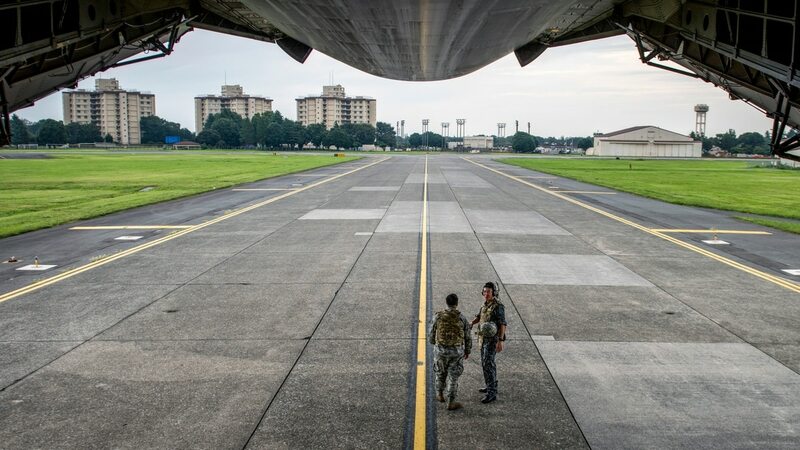 The continuing security challenges in the region and the presence of forward deployed elements of the U.S. military means that Yokota’s status of a regional logistics hub is here to stay and even increase in the future. Asked to sum up the importance of the base and the wing’s mission, Colonel Otis Jones, commander of the 374th AW, told Defense News that “because of our proximity to Tokyo, along with the unique airlift capabilities we contribute to the region, Yokota, and specifically the 374th Airlift Wing, provides an advantageous hub for cargo and personnel moving into and out of the Pacific area of responsibility.” The wing also executes rapid global mobility through agile airlift operations across the Indo-Asia-Pacific region and engages in regular bilateral engagements with the Japanese Self Defense Force, surrounding communities and the local Japanese government.